Once you've mastered crocheting a scarf or other rectangular item, you'll probably want to learn how to make a crochet hat. It's easy to create a simple stocking cap or beanie using basic crochet stitches. With a bit more experience, you can try a lacy sun hat or a beret. You start at the top of the crown, and either make a couple of chain stitches or a "magic ring." To make a magic ring, you wind the long end of the yarn around two fingers and pull a loop of the long piece under the short piece. Then, to stabilize the ring, pull one chain stitch through the loop. Single crochet anywhere from six to 12 single crochets in the ring, and then double the number of stitches in the second row. Continue increasing each round until you reach the head circumference. Depending on the type of hat you are making, you either continue the same number of stitches for a number of rows to make a roll up brim, or you increase the number of stitches to make a wider brim. To make a beret or tam, once the head circumference is reached, continue to increase the number of stitches per row and then reduce them to again to the size of the head circumference. 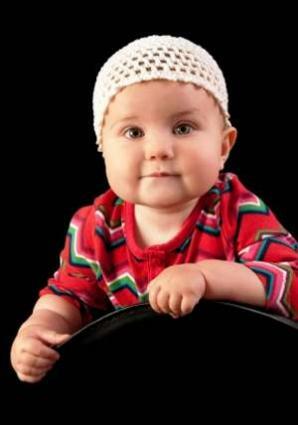 It is possible to make hats, such as baby bonnets, with rectangles. If you use an open, stretchy crochet stitch, you can join the rectangles to create four sides of a cube that will conform to the baby's head. If you thread a ribbon through the bottom edge of the rectangles, you get a bonnet that ties under the baby's chin. For warmth, choose wool, wool blend, angora, or synthetic yarn of medium to bulky weight for winter hats. For extra warmth, consider felting (or, more correctly, fulling) a crocheted wool or wool-blend hat. Fulling makes the finished product denser and less permeable to moisture than simple crochet stitches. For lacy summer hats, use cotton, silk, cotton-blend, or silk blend yarn for absorbency and lighter weight. Yarn colors for hats are almost limitless, but dark and bright colors work well for winter hats, and white or pastel yarns work well for summer hats. Dark colors absorb heat, and light colors reflect heat. Use textured, variegated, or multi-colored yarn to add interest to your hat. Your crocheted hat can also have stripes or a multi-colored pattern. You can add decorations, such as buttons, beads, crocheted flowers, pompoms, embroidered appliqués, or hand embroidery to personalize your hat. You can also add a crocheted lace edging or picot edge to the brim of a hat. Woman's apple pie hat - this hat must have gotten its name because it's easy as "apple pie"
Not only is it fun to make hats for your own use, but hats make great gifts. Matching baby hats and booties make an inexpensive, but personal, way to welcome a new baby. Beanies and stocking caps with matching mittens make great presents for kids. Your sister, mother, or grandmother will enjoy a nice cotton sun hat for vacation or gardening. If you have a friend or family member undergoing chemotherapy, a handmade hat will surely be appreciated. Use your imagination when decorating your crocheted hat. When you finish your first hat, you'll be glad you learned how to make a crochet hat.